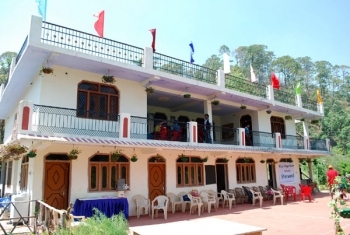 Riya Village Resort is located in Riya Gaon in Jeolikot of Nainital District. Resort is surrounded by thick forests and wild life. It provides our guests full peace of mind and calmness. The place is ideal for people looking for peaceful environment away from the crowded Nainital. There are many walking trails through the surrounding jungle. Some of the popular walks from Riya Gaon are: Trek to Patwadangar Manora Peak and Bur Bhumiya Mandir from where you can see the wide range of Tarai Belts and rich lush green forests. Nainital-Lake city Nainital is just 11 km away from the Riya Village resort. Riya Gaon lies 22 kms away from Kathgodam on the road of beautiful Nainital. Riya Gaon is surrounded by thick forest. It has richest oak, pine, bamboo, cedar, rhododendron and other coniferous forest over there. The rooms in Riya Village resort are well-furnished with twin and four beds and attached washrooms with hot and cold running water. The rooms are designed such that they provide good ventilation and fresh air for full relaxation and mental peace. The surrounding jungles offer excellent walks. - Deluxe Rooms: Oak and Pine are deluxe rooms, with stunning views across the forest valley to the awesome mountain range. The rooms have king size super king or twin beds and are en suite with attached bathrooms. - Deluxe Attic Suite: Cedar our deluxe attic suite has a king size bed spacious bathroom. An additional bed can be made up for a child and other little extras are available to make your stay more comfortable. - Standard Room: Standard rooms are cottage style with comfortable furniture. All rooms are en suite with bath and other little extras to make your stay more comfortable. Outdoor Activities - "Jungle Mein Mangal"
- Please Note: We appreciate our guests to inform us at the time of booking what all activities they would like to avail. - Drive from Delhi via Kathgodam and Riya Gaon - 7hours. - Drive from Delhi via Ramnagar (Corbett National Park) and Kaladhungi Nainital - 7 and half hours.